Sahar Aryan performs on Afghan Star. Afghanistan's American Idol: Americanization or Anti-Americanism? Afghanistan’s “Afghan Star” has become a venue for forging Afghan identity. In 2005, TOLO TV channel introduced Afghan Star, a singing competition that eventually became the most popular program and the most-watched show in Afghanistan. Presently a considerable number of young Afghans are watching season 11, in which two out of the top twelve contestants were women. What is intriguing about the Afghan Star phenomenon is the way this TV program, which follows a format common around the world, becomes indigenized and adapted to the context of Afghanistan. In Afghanistan, a history of external interference is closely connected to domestic opposition. Understanding how the great powers have created an unstable and fragile Afghanistan is part of almost every important debate in the country. Thus, popular culture can be described as a culture of resistance against foreign invaders. This is apparent in the increasing efforts of activists developing the Afghan language, the Afghan culture, and the Afghan national identity. However, Afghan Star is a part of the public sphere in Afghanistan that seems to be overwhelmingly American. In this sense, perhaps the biggest question is whether or not Afghan Star is evidence of the Americanization of Afghanistan. Some observers believe that Afghan Star is little more than American soft power aimed at justifying the project of neo-colonialism. According to this logic, this Afghan version of American Idol is the offspring of a larger Americanization project. Although there is little doubt that this kind of reality show is American in origin, a close look at Afghan Star reveals the ways in which this TV program goes directly against Americanization. Ultimately, it provides a stage for the songs of resistance, an opportunity for young Afghans to sing about the subjects affecting their lives and to speak about their beliefs, values, and the political issues that matter to them and to the Afghan society. For example, Zeeba Hamidi is one of the top twelve contestants in Afghan Star’s season 11. She believes that the sorrows and hopes of Afghanistan can be best described through rap music. In her performances, Zeeba sings on topics such as the social and political problems of Afghanistan. The questions that she raises in her songs are repetitive and pertain to what Afghan activists address in almost every public debate: questions about independence, the interferences of Western countries, and the autonomy of Afghanistan. Tell me who makes this nation great? America? Pakistan? Russia? Saudi Arabia? Who would do it then? And the foreign countries that are cruel. We all are in need of understanding such things! Another female finalist on this season of Afghan Star is Sahar Aryan. Sahar’s songs are largely inspired by the social issues arising from Afghanistan. 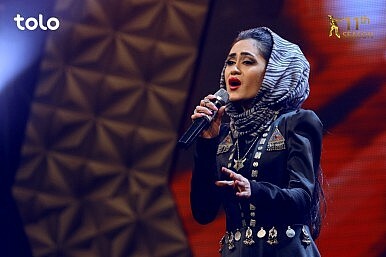 In season 11, episode 19, Sahar performed an impressive song as a tribute to Farkhunda Malikzada. Farkhunda was a 27 year old Afghan woman who was accused of burning the Quran, which resulted in her public murder by her accusers on March 19, 2015. Afghan people were shocked after it was revealed that Farkhunda did not burn the Quran, nor was she working with Americans. Sahar’s performance on Afghan Star aimed to capture some of the heart-rending scenes of Farkhunda’s attack: her bloody face, her spoiled clothes, and also her voice, which eventually gave a fresh impetus to women’s voice in Afghanistan. This soil is mine, I will never cede it to the foreigners. Although Afghan Star is an Afghan version of American Idol, it has become a largely anti-American program, where the songs performed link to the Afghan national identity and resistance against foreign invaders. It is no exaggeration to suggest that the Afghan Star stage is a site of resistance and opposition. From the rap music of Zeeba Hamidi to the performances of Sahar Aryan, the stage has not only given voice to the young singers’ bitterness, frustration, and resentment, but also to their enthusiasm for building a better Afghanistan: independent and persistent. Nima Zahedi Nameghi is a Ph.D. student in the Department of Sociology at Laval University, and a researcher at the Centre Interdisciplinaire de Recherche sur l’Afrique et le Moyen-Orient (Interdisciplinary Center for Research on Africa and the Middle East). In Afghanistan’s historic Bamiyan province, a skiing competition is showing off the country’s changing demography.